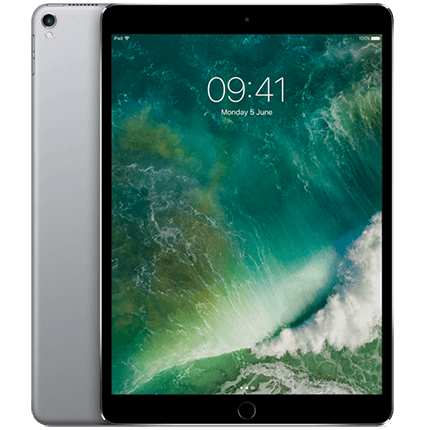 Immensely powerful, portable and capable, the 10.5-inch iPad Pro features a redesigned Retina display that is Apple's most advanced yet, while the A10X Fusion chip delivers more power than most PC laptops. Looking for the new iPad Pro 11 inch? Get your new iPad for £0 upfront. Make sure you’re signed in, and get started. iOS 11 features shown. iOS 11 will be available as a free download this autumn. Apps are available on the App Store. Title availability is subject to change. The 10.5‑inch model is available in space grey, rose gold, gold and silver. The 12.9‑inch model is available in space grey, gold and silver. Some features may not be available in all countries or all areas. See www.apple.com/uk/ios/feature-availability for complete list.